In the summer of 2017, we took a special topics course called Social Justice through Technical Communication at the University of Texas at El Paso. As part of this course, we were asked to document our course readings and to write a collaborative entry for the DRC Wiki, where we outlined the articles that we read and discussed together. In this blog post, we’ll introduce and extend the contributions that we made to the DRC Wiki, specifically by providing more context for the course itself and by highlighting some of the major takeaways that we were able to gain through this experience. It’s important to note that the location of our class directly influenced the discussions and interests that we hold as students. El Paso is located along the Rio Grande river, across the Mexico/U.S. border from Ciudad Juarez, the largest city in the Mexican state of Chihuahua. The University of Texas at El Paso, where our class met, stands directly across the border, and is the only research doctoral University in the United States with a Mexican-American majority student population. Many UTEP students and K-12 students in El Paso cross the border from Ciudad Juarez to attend school every day, thus experiencing added commute times and having to adhere to often-discriminatory security and immigration measures. The students in the Social Justice through Technical Communication course described in this entry are primarily from the El Paso area, having spent many years living, studying, and teaching in the city. As we describe in our Wiki entry, our collaborative history in El Paso has fueled our commitment embracing social justice both in and outside of the classroom. You can read more about our individual backgrounds here. The purpose of the course was to help us think about how technologies are created based on specific ideologies and to provide a space where students can collaborate to design technologies that purposely work to counter injustice for marginalized populations. As part of this work, we discussed articles that were organized into three units, including “Foundations in Technical Communication,” “Foundations in Social Justice,” and “Technical Communication on the Border.” We also discussed the ideologies embedded in common tools and applications, such as fitness and exercise apps, learning management systems, and more. We envisioned how we could redesign existing software to further consider issues of equity and justice, and how we could design our own tools and applications to facilitate human activity. Then, after developing initial understandings of technical communication and social justice, the “technical communication on the border” unit helped us localize technical communication and social justice conversations in our own community in El Paso. What is Social Justice? Why does it matter to Technical Communication? Most of our class did not have prior training in technical communication. Instead, many of us have backgrounds in education, working (or studying to work) as teachers in K-12 settings. Although we may not have had much experience with the field of technical communication, our experiences as educators often directly related to social justice, as we consistently work to create and foster ethical, loving environments for and with our students (see Django Paris and Samy Alim’s discussion of Culturally-Sustaining Pedagogies). These relationships and orientations to social justice are especially critical for us teaching in El Paso, where many of our students have and continue to experience educational injustices. In our class, we drew definitions of social justice from many different sources, including Natasha Jones’ (2016) emphasis on enacting social justice as a process of “deconstructing and dismantling hegemonic ideologies” to “remove the objectifying power of the dominant,” thus enabling “focus to turn to human experience” (p. 5). We were also drawn to Jones, Walton, and Moore’s (2016) concept of “antennarratives” in relation to social justice in technical communication. Drawing on Boje (2011), Jones, Walton, and Moore (2016) describe antenarratives “a disruptive ‘before’ story that seeks to destabilize and unravel aspects of the tightly woven dominant narrative about who we are as a field, what we do, where our work occurs, and what we value” (p. 212). We found the concept of “antenarratives” particularly useful for our class, especially because many of us are seeking to disrupt traditional notions of what it means to be students, educators, and researchers in El Paso through our work. Specifically, we aim to include voices of El Paso residents in general narratives about what it means to live, learn, and work on the U.S./Mexico borderland. As Angela Haas (2012) reminds us in her discussion of race, rhetoric, and technology, “race and place matter to technical communication research, scholarship, curriculum design, and pedagogy. In fact, they are key to what can be imagined, what gets imagined, and who imagined in our profession” (p. 279). You can read our summaries of social-justice articles discussed in our course on our Wiki entry. After discussing foundations in social justice and foundations in technical communication, we continued the course by reading and talking about how social justice and technical communication issues play out here in our local context. To understand how we can apply social justice principles in our technical communication work on the border, we read and discussed articles on border research pedagogies, including Noe’s (2009) discussion of Mexican corridos as rhetorical practices used by marginalized populations. As Noe (2009) explains, borders are sometimes physical, politically-sanctioned boundaries, but border cultures are localized, fluid, and constantly emerging representations of many different people, languages, and practices. While we read and talked about experiences and definitions of borders, we also continued doing some research on how the City of El Paso is represented in digital spaces. Specifically, we looked at websites like TripAdvisor and Yelp, noting that many of the recommendations presented on these sites as things to do or see in El Paso did not reflect our own experiences living and working in this city. For example, many of the recommendations for things to do in El Paso include activities in Las Cruces, NM and other neighboring cities, while simultaneously ignoring the many activities that people can enjoy right across the border in Ciudad Juarez. Likewise, reviews for our favorite local restaurants and establishments were often lacking or missing from review sites like Yelp. Thus, after noting this potential design discrepancy, we decided to design a survey (in both Spanish and English) that asked local El Paso residents to discuss their favorite things to do, and we reached out to all of our networks to get as many different responses as possible. Perhaps unsurprisingly, the responses gained from local residents did not reflect the recommendations made on sites like TripAdvisor. For example, out of the 167 survey responses that we were able to obtain in just 4 days, 55 mentioned visiting Ciudad Juarez for food, learning, and entertainment. Other local events, like supporting the El Paso Chihuahuas by attending baseball games, were largely represented in our survey results while being entirely absent from TripAdvisor recommendations. Thus, as we compiled our results, we started to think of ways to best represent our data for various stakeholders. What we ended up with through our brief study of what El Paso residents like to do is a reflection of the multi-layered interests of our community. 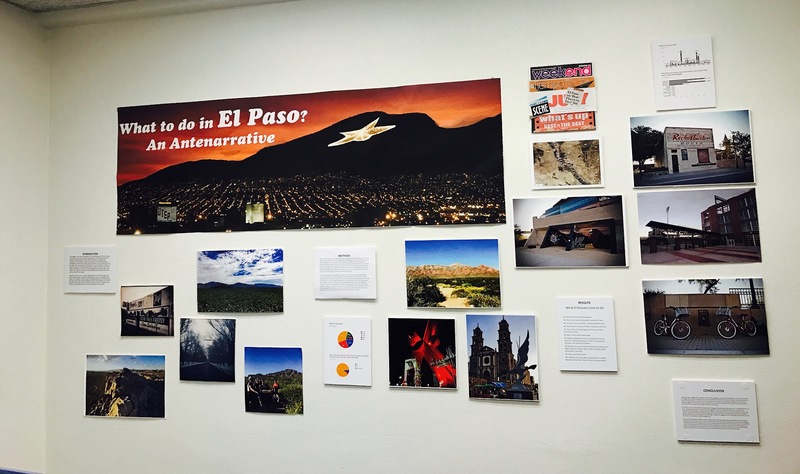 Having read and discussed issues of representation through our course readings, and after seeing the connections between the course readings and our own local context through our summaries for the DRC Wiki, we decided to present our results in an art exhibit entitled, “What to do in El Paso: An Antenarrative.” Stemming from Jones, Walton, and Moore’s (2016) discussion of antenarratives, this exhibit reflects a counterhistory of El Paso, illustrating the many things that El Paso residents enjoy outside of what may be typically considered the local highlights. The exhibit contains pictures, a video (embedded below), and graphs representing our survey data, and will be displayed during a local reception that we will hold for our community in November. In this way, as technical communication studies focused on social justice, we seek to present our findings in a way that will be accessible to the many community members who helped us with this project. We are grateful to Professor and Artist Elvira Carrizal-Dukes, who advised us and came into our class to discuss our plans for the art exhibit. Conclusion: What did we learn from writing an entry together on the DRC Wiki? Putting together an art exhibit as a collaborative course project was definitely out of the box for us. However, collaborating on this final project was made much easier because, through our ongoing interactions on the DRC Wiki, we established relationships and understood each other’s work structures throughout the course. No assignment in this class was individual. Instead, we were asked to contribute pieces to our collaborative Wiki entry after each class reading. We would initially work on a Google doc with every class member throwing in notes from their readings in a different color font, and we then collaborated in class to edit the doc into what would be published on the DRC Wiki together. Thus, from the beginning of the semester, we learned to feel comfortable sharing work in progress, editing each other’s writing, and making decisions about what to include into what would be shared with the world through our collaborative entry. By the end of the course, working on a collaborative final project seemed like a natural progression from the DRC Wiki entry itself, as we had already established a method for collective writing and decision making. In the end, what evolved from the class was a collaborative project that will be useful not only to us and our growing understanding of technical communication and social justice, but also to the local community who was willing to help us create this installation. We are grateful to the DRC for providing us with many platforms for collaborating in putting this together. Haas, A. M. (2012). Race, rhetoric, and technology: A case study of decolonial technical communication theory, methodology, and pedagogy. Journal of Business and Technical Communication, 26(3), 277-310. Jones, N. N. (2016). The technical communicator as advocate: Integrating a social justice approach in technical communication. Journal of Technical Writing and Communication, 46(3), 342-361. Noe, M. (2009). The corrido: A border rhetoric. College English, 71(6), 596-605.